75 per cent of the Singaporean population is Chinese, so it should come as no surprise that the Chinese New Year is one of, if not the, biggest holidays of the year. Many people look forward to the occasion — either because they love celebrating it, or because they see it as a two-day break from work. For those that do celebrate Chinese New Year, the period can be a busy one. Spring-cleaning the house, buying new clothes, preparing food and snacks for all your guests, and interacting with extended relatives you only see once a year. For the uninitiated, it can be quite confusing — maybe you’re celebrating this year for the first time with friends, or maybe you’ve just moved to Singapore and want to know what’s going on. Either way, we’ve got what you need — an easy guide for you to know what you should and should not do during Chinese New Year. The tale of Nian is a story told to children about the origins of Chinese New Year. According to the legends, there was a mythical beast in ancient China called Nian. It was a terribly ferocious animal that has the head of a lion and the body of a bull. On the first day of every New Year, Nian would descend from the mountains and terrorize villages by eating livestock, crops, and even young children. The people all lived in fear of Nian, but as the years passed, they discovered that the beast had some weaknesses — it was afraid of fire, loud noises, and the colour red. Armed with this knowledge, when the New Year was around the corner, the villagers hung red lanterns and red cloth banners all around their village. When they saw Nian approaching, they used loud firecrackers to chase it away, and from that day forward, Nian never came to the village again. This tradition continued year after year, and till today during Chinese New Year, red is the predominant colour used for decorations, and firecrackers are set off to ward off evil and bring in good luck. 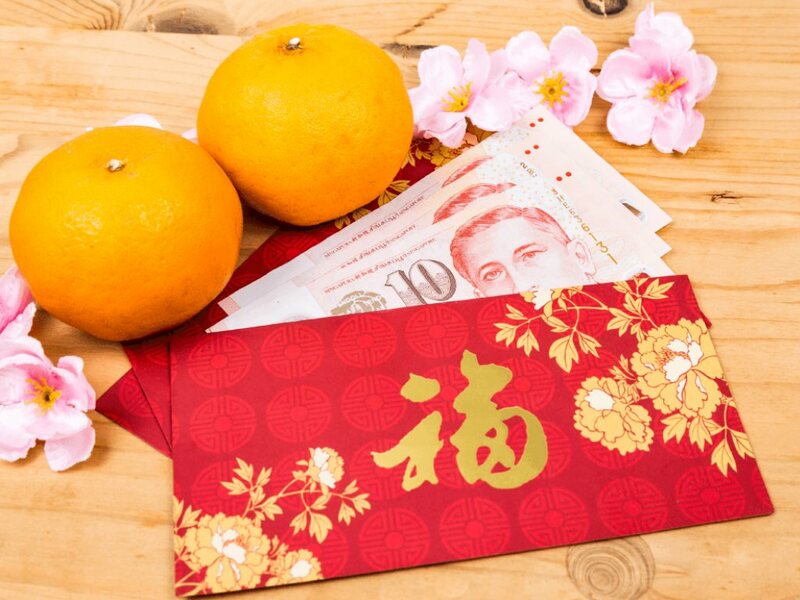 Oranges are exchanged as a symbolic gesture of wishing each other good fortune, and red packets with money inside, known as hongbaos, are given to children and unmarried young adults as a way of wishing them good luck in all their endeavours. Chinese New Year is all about prosperity, wealth, and good fortune. You’ll want to get rid of all the bad luck you have and be as welcoming as you possibly can to all the good luck. The Chinese people believe that there are some things you should never ever do if not misfortune will fall upon you. In case you end up offending someone because you don’t know any better, here are some of the more common superstitions surrounding Chinese New Year. Black and white are colours that are mostly associated with funerals and mourning, and it is believed to bring bad luck should you wear it during Chinese New Year, especially on the very first day. Instead, wear bright colours like red and yellow as these are considered to be more auspicious. There’s a reason why spring-cleaning is done before the New Year. Many believe that sweeping the house or taking out the rubbish during the first two days for the New Year symbolises sweeping away the good luck and fortune around you. If you’re OCD and absolutely cannot stand seeing dust or dirt on the floor, at least wait until the fifth day before sweeping. In Chinese, the head is associated as the ‘beginning’, so it is recommended that you do not wash your hair for the first three days of the Chinese New year, or you might start the year on a bad note. Cutting your hair is also seen as a bad omen because you’re cutting your wealth away, and using scissors or sharp objects during this time could mean you will have many quarrels with people in the future. It is recommended to open all the doors and windows of your house by the stroke of midnight on Chinese New Year’s Eve. This will allow all the bad luck from the old year out, and good luck from the New Year to flow in. In total, Chinese New Year lasts for 15 days, and every day has a special meaning attached to it. For example, the seventh day is known as the Day Of Mankind, or the birthday of all men. On this day in Singapore, people eat tossed salad with raw fish called yusheng to encourage wealth and prosperity. The third day of the New Year also has meaning behind it — it’s not auspicious to visit relatives on this day as this will bring misfortune on the family you are visiting and cause more arguments amongst each other. Lending or borrowing money to anyone is frowned upon during Chinese New Year. It is seen as a sign that you’re either losing wealth by lending or that you’re likely to be borrowing often throughout the year, which signifies that you will have poor fortune till next year.